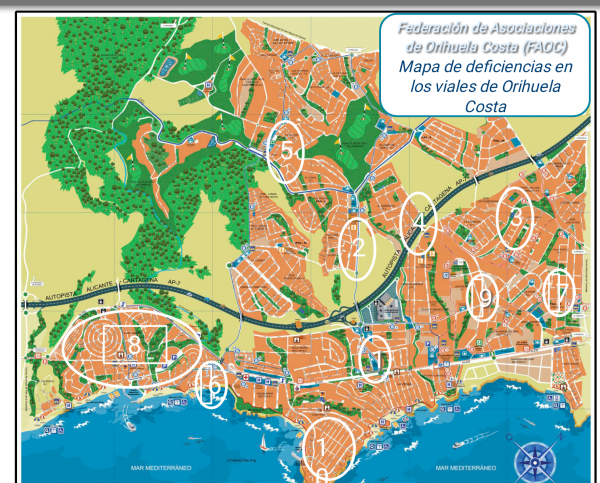 The FAOC (Federación de Asociaciones de Orihuela Costa) and its partner organisations and groups have long been compiling a list of the many serious deficiencies that we are all aware of on the coast. The latest inventory includes broken pavements and the poor state of our roads which they have drawn attention to once again with the Orihuela Ayuntamiento. The list is accompanied by an album of photographs submitted by members of the public. The great majority of the problems were highlighted in the proposal for the 2017 Participatory Budgets, which the group presented to the Council in September 2016, almost 6 months ago. FAOC have zoned the needs for asphalting in the document “Asphalted needs O.C.”, having identified 10 sites where necessary action has been prioritised. Access to the Playa Flamenca Secondary School and the bridge over the AP7 (zone 4): priority action. A large number of cars and people (children, for the most part) use the area daily as they arrive and depart from college, with considerable risk. This is a very poor situation. Avda. Villamartín (zones 1 and 2): several sections of the avenue along which thousands of cars travel on a daily basis, many going to Zenia Boulevard. 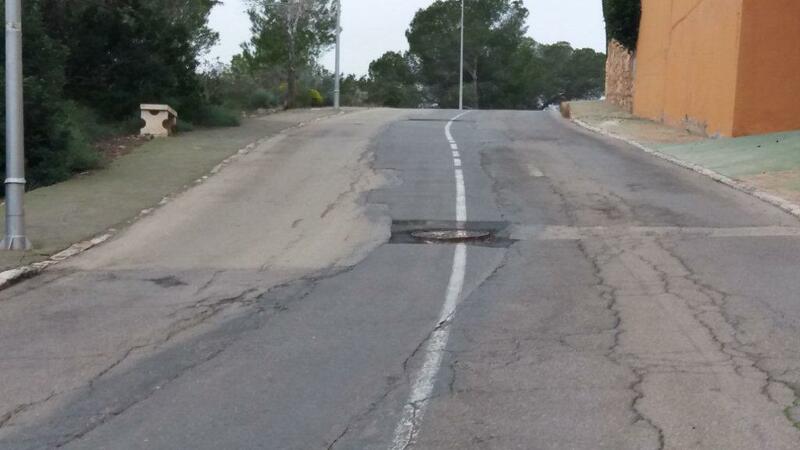 Dehesa de Campoamor (zone 8): There are extensive areas with serious asphalting deficiencies, there has been practically no maintenance work carried out in the area for more than 10 years. FAOC accept that some actions are being carried out in some areas (av. Villamartín, access to the Playa Flamenca Institute, etc.) by maintenance staff, but these are only minor repairs which are totally inadequate to the needs of the area. Holes that are filled quickly reappear in an even worse condition just days after being repaired. 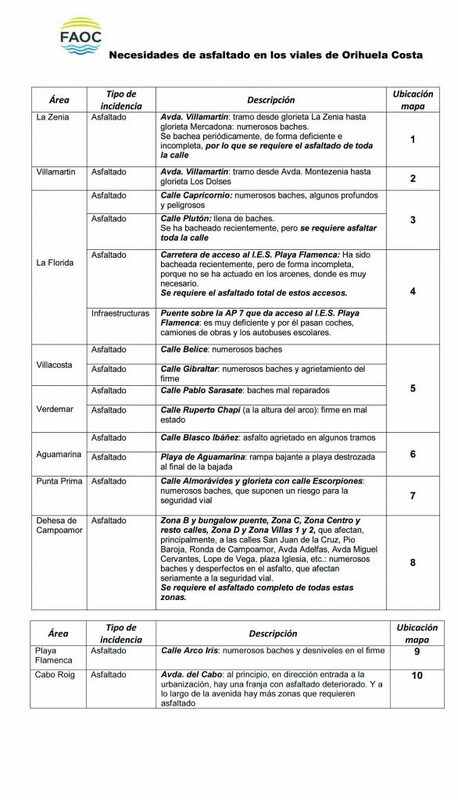 The works currently being carried out are totally insufficient for the needs of the Orihuela Costa, and they are also far too few as can be seen on the attached schedule of works that are required, many of which suffer such a level of deterioration that they pose a risk to road safety and to the safety of the general public as well as presenting a very negative image of those responsible for the maintenance. Although the government team repeatedly state that there are upcoming asphalt actions in the process of being financed with the remnants of previous budgets, as the months go by nothing has been done. FAOC therefore request that the Department of Infrastructure includes, in the 2017 Budget, the funding necessary to cover all needs so that a comprehensive “asphalt operation in Orihuela Costa” can be carried out.